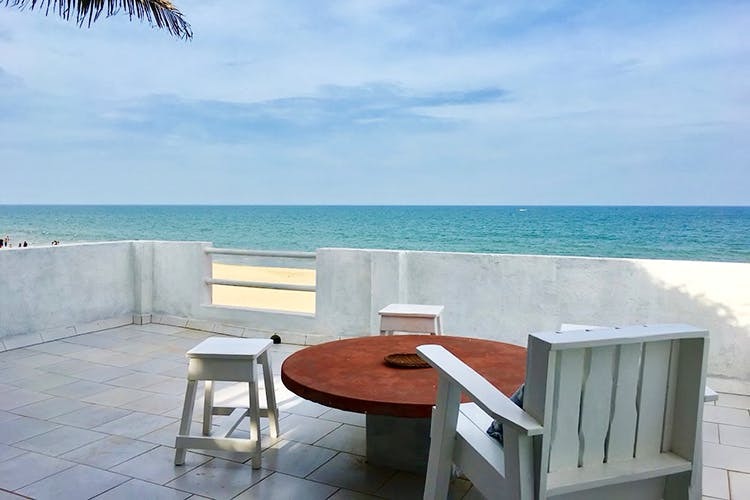 Waking up to a beach view in Pondicherry, and that too the gorgeous Serenity Beach is something else. Luckily for you, the gorgeous Airbnb Casa Vista we happened to find on our last visit to the French Town, offers just that at INR 725 per night! It's a gorgeous property with pale blue walls, cosy nooks, and a terrace that looks out to Serenity Beach. In the evenings, the terrace is perfect for under the stars conversations with bae or BFF. The beach is just a hop, skip, and jump away from Casa Vista, so be sure to pack your bathing suits, sunscreen, and towel to beach bum it like a pro. Whether you are going to nap or soak in some Vitamin D (or Vitamin Sea! ), no one's going to bug you, except for some doggos who might curl up next to you. Morning yoga, sunset and the whole beach experience, just minutes if you are staying here. It's almost like a private beach experience. One bedroom room, a living room, three beds, and a bathroom are your accommodation facilities. If four people are checking in, it's INR 2,900 per night which works out to INR 725 per person per night. It's a deal if you ask us, given that you get WiFi, power back up, and a kitchen. Much better than roughing it out at a hostel or a shack, unless you are that sort of person. Hit up The Motorcycle Diaries for their hot chocolate and jumbo burgers. It's about 10 minutes from the property. Hit up Sunset Point for the best sunset view at that side of town. Also, two-wheelers on rent can be arranged by the host.